2016 NYC Trip Photos #26: Do You Remember Rock & Roll Radio? « Midlife Crisis Crossover! 2016 NYC Trip Photos #26: Do You Remember Rock & Roll Radio? It’s mind-boggling to me that one of the greatest bands from the original American punk rock scene released their self-titled debut album a full forty years ago. 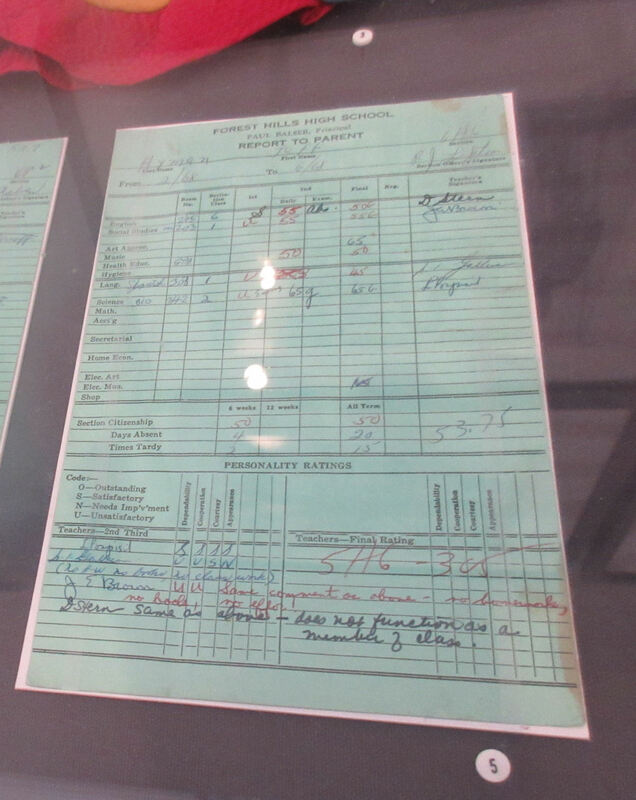 When I learned the Queens Museum was hosting a temporary exhibit commemorating the anniversary of their recording career, it shot straight to the Top 5 on my vacation to-do list. Fortunately my wife and son were generous enough to allow this fan’s diversion. In April 1976 I was too young to appreciate the Ramones or, y’know, music in general. My tastes and criteria changed circa 1989 (the year of their eleventh studio album Brain Drain) and the Ramones became one of many bands outside the Top-40 populist dominion whose discography commanded my Walkman, boombox, and car stereo over the next decade or more. I’m the kind of old fan that owns more of their works on cassette than on CD, but one who’s young enough to own none on vinyl and to have first encountered them on their first greatest-hits compilation, 1988’s Ramones Mania. The Ramones’ style was rock distilled to its minimalist essence, a direct assault on the excesses of other ’70s genres — the tinny smarminess of disco, the overwrought self-importance of prog-rock, the country/western hoedowns and easy-listening lullabies that dominated the pop-radio charts. Born and bred in the parts of Queens that didn’t care about designer clothes or lockstep consumerism, the Ramones cranked out tunes that were curt, simplistic, brutish, catchy, and free of major-label artifice despite their longtime relationship with Sire Records. They were often tongue-in-cheek, sometimes to the point of feigning cartoonish stupidity. For a kid like me who grew up a lower-class loner with an odd set of criteria for choosing my art and artists, their concise wall-of-sound anthems were like coordinated, self-aware cavemen clubbing at my subconscious through the determinedly clean-cut veneer of the cliques that surrounded me, trying to signal me to another, more relatable world than the better-dressed one that was content to leave me hermetically sealed off in my own outcast bubble. 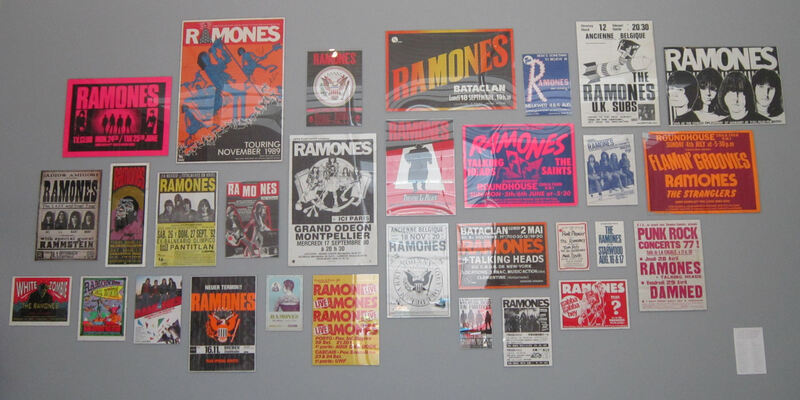 And now the Ramones are a band that belongs in a museum. That exhibit, “Hey! Ho! 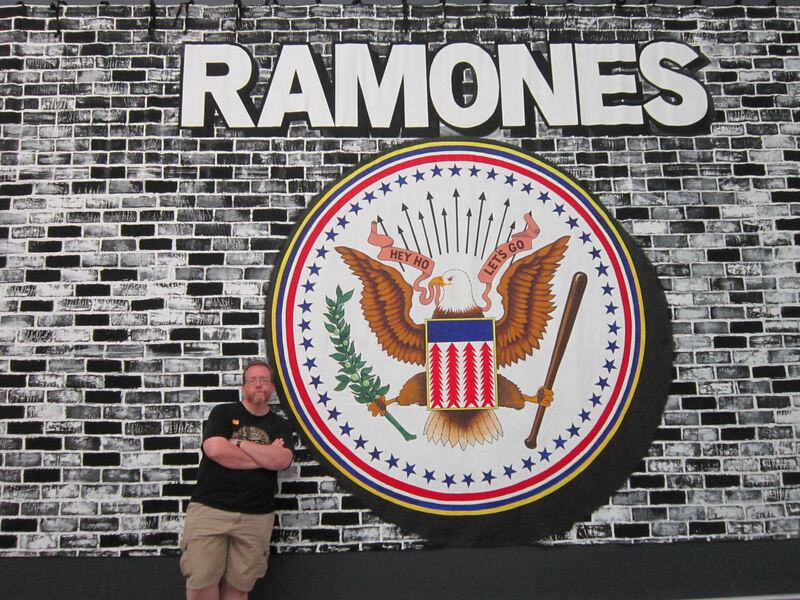 Let’s Go: Ramones and the Birth of Punk”, ran at the Queens Museum through July 31st. 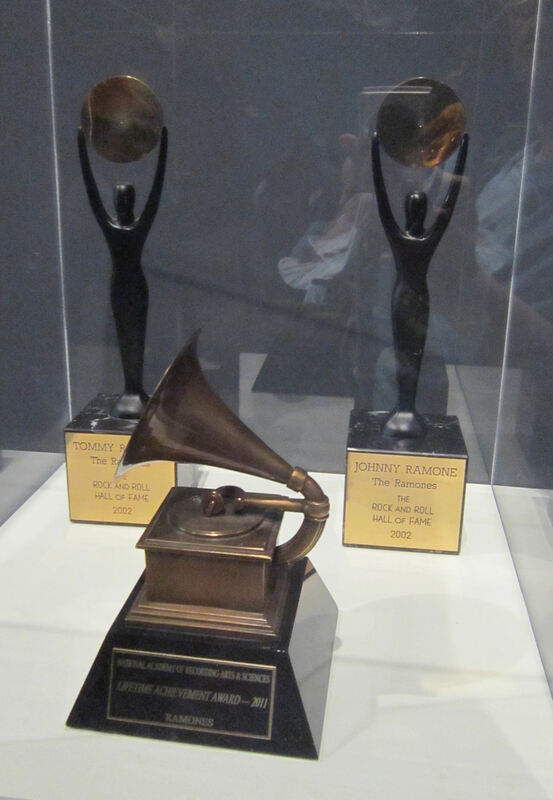 As of this writing it’s been relocated for a five-month stint at L.A.’s Grammy Museum. The following pics are examples of the art and artifacts in which I had the pleasure of immersing myself while Anne and my soon waited patiently even though they didn’t quite get it. Maybe you had to be there and be like that. 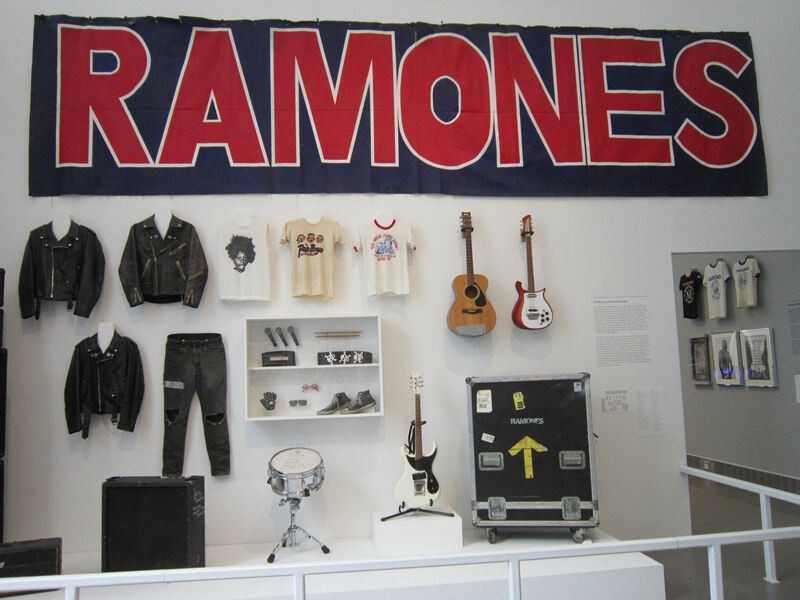 The Ramones: the official instruments and actual clothing. 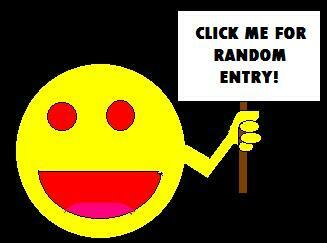 Or uniforms, I guess, if you think of punk as this metaphorically regimented thing. 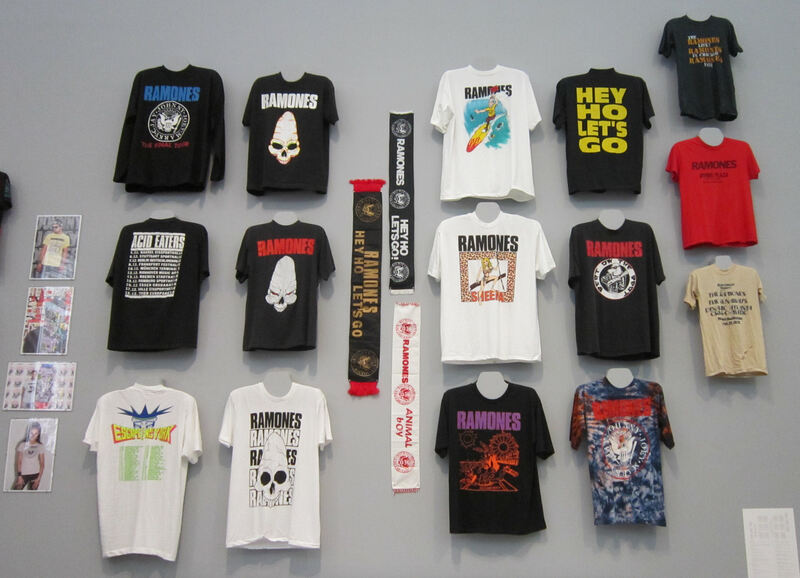 Souvenir T-shirts from all the decades, harder to find and buy before the internet and before the birth of Hot Topic. As of tonight their site has three Ramones shirts and a pair of Ramones sweatpants available, all modeled by hipsters half my age. Before the internet and social media, bands had to pay for these things called “flyers”, which were like tacky websites printed on paper with show schedules and random pictures in lieu of Google Image clip art. Vinyl copies of all fourteen studio albums, from their 1976 debut to 1995’s ¡Adios Amigos! 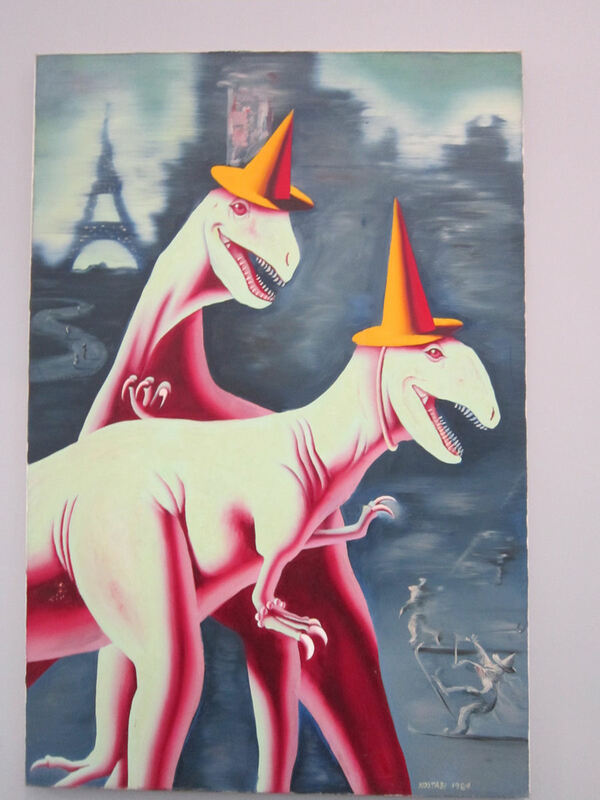 Mark Kostabi’s Enasaurs was the original cover painting for the aforementioned ¡Adios Amigos! If I read the accompanying placard correctly, changing the traffic cones to sombreros was the label’s idea, among the other retouches. 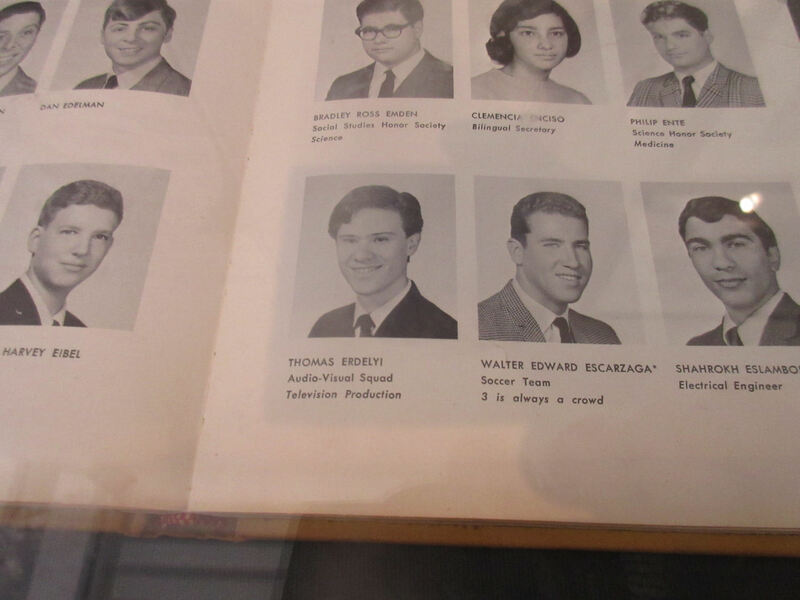 …and original drummer Tommy Ramone’s yearbook photo. The band received numerous awards, most of them after their careers were over. The original four members — Joey, Johnny, Dee Dee, and Tommy, plus their second drummer Marky — were inducted into the Rock ‘n’ Roll Hall of Fame in 2002. In 2011 they were granted their first and only Grammy, a Lifetime Achievement award, effectively tying for total Grammy count with Milli Vanilli. Several walls were covered with tributes and art from fans famous or otherwise, including these recent paintings of the original foursome by Shepard Fairey. What’s more dangerous than a self-aware caveman? Coordinated ones. Ha! Nice trip down memory lane. Funny. And thanks! Outside of the Rock ‘n’ Roll Hall of Fame, my musical tastes rarely lend themselves to tourism, and our travels don’t often lend themselves to too many moments of music nostalgia. The Queens Museum was a rare, welcome convergence of my spheres.